Spincast reels are generally derided in angling circles as a beginner’s piece of tackle, only suitable for tourists and children. That’s not quite the truth, though, these simple reels can have a variety of uses for the dedicated angler looking for something a little bit different. These lightweight reels are simple to use, and the main niche you’ll find for them is in fishing for panfish and other small varieties. They’re really not made for extended fights or catching monsters, but they’re great for the weekend warrior type. More experienced anglers might use one as part of a lightweight setup for catching bait fish as well. It’s important to recognize that even the highest quality spin casting reel isn’t suitable for prolonged fights and large fish, they simply don’t have the power for it. Their technical statistics can show this to us quite easily, they’re often low-geared and have underpowered drags compared to spinning and baitcasting reels. Let’s take a look at some of the best offerings currently on the market. You can’t go wrong with any of these, and a close look at each will easily net you the exact reel for your needs. 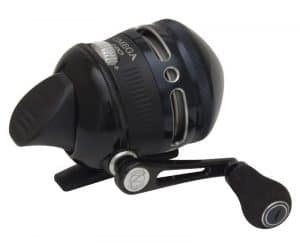 The Omega ZO3PRO spin cast reel is one of Zebco’s most advanced offerings. Spincast reels are, as a rule, pretty cheap, and you can see that clearly by looking at the price of this fantastic option. 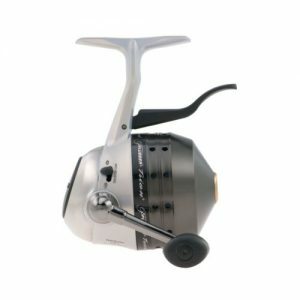 This reel comes with seven bearings integrated, making for a smooth action to augment the already impressive retrieve. It’s light-weight and easy to use as well, suitable for both the dedicated panfish enthusiast and the novice angler. Even better, it’s easily configurable for either left or right-handed angling so pretty much anyone can use it. It’s also light, weighing in at only 10.6oz. Combined with the ergonomic design you’ll find that it fits easily in your hand and is comfortable to use throughout the entire day. One thing to keep in mind with this reel is that is definitely not suited for braided line. If that’s your preference, you’ll want to look elsewhere. This reel is high quality and boasts more bearings than any of the competition though, and if you’re looking to invest a little bit of money into a spincast reel this is definitely a reel to take a closer look at. The Pflueger Trio 10U is a great option for the beginning angler, and at the low cost, even someone who just wants to try their hand on a weekend trip won’t be disappointed. The low price point is probably the most enticing feature here, but it still makes a respectable reel for small fish. It’s not a wonder of technology, but it is a solid piece that you can rely on for a good while. This reel has only a couple of bearings but still works smoothly enough to make a good impression. It also has a bait clicker, so you’ll know when something has a hold on your line. The Trion 10U is a great option for a kid’s reel, it’s easy to use and has a pair of pick-up pins unlike most of Zebco’s offerings. This makes it easier to rest assured that your line is locked into place, and the extra level of insurance there means you won’t have a false start on setting a hook. For the price, this one simply can’t be beaten. If you’re a weekend fisherman or just looking to buy something for your child to get started, take a close look at this product from Pflueger. There aren’t many spin cast reels that are suitable for ocean fishing, but Zebco has delivered with the 808. It’s perfect for light surf or pier fishing and just might find a place on your boat if you want to keep a setup dedicated to catching baitfish like mackerel. 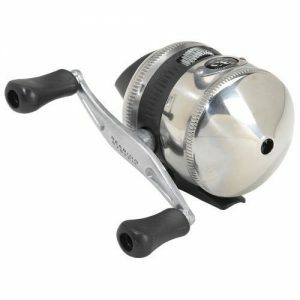 This reel is a bit rough, it doesn’t feature a whole lot of anti-friction capabilities which can be a drawback for those who expect a silky smooth action. What it does offer, though, is a surprising amount of line capacity for a spin cast reel. It features dual ceramic pick-up pins, which makes it more reliable than a lot of spin cast reels on the market. It also comes with a bait clicker, so you’ll know when to set the hook and get into the fight. If you’re looking to catch smaller marine fish, this reel makes a fantastic choice. It’s not going to pull in shark or halibut, but it should put up enough fight to contend with smaller rockfish, surf perch, and flounder. If you’re an angler who’s just getting into saltwater fishing from shore, this reel can make for a wise and cheap way to get started if you pair it with the right rod. This offering from Zebco does come in at a little bit higher price than some of the other options, but the smooth action and fairly impressive retrieve will more than make up for it. There’re seven bearings in this one, making sure that your line will stay smooth all day. The light weight of the reel makes this fantastic for those lazy, all day trips. Your arms and wrist won’t be getting tired quickly at all if you choose this option. Attached to the right, lightweight pole, you may even have trouble noticing it’s there after a couple of beers. These high-end spin cast reels are especially well suited for the person who’s a fanatic for panfish. If you see a lot of crappy and bluegill in your future, this is the reel that will help you achieve that fantastic, and delicious, dream. This is a fantastic mid-range reel from Zebco. It boasts a fairly impressive line capacity and retrieve rate. Once you factor in the cost, it quickly becomes apparent that this reel has some of the best value for the money you’ll be able to find. The gear ratio on this reel is 3.6:1, which would be excessively low for any other type of reel but is actually pretty awesome for a spin cast. It only has a single bearing so it’ll feel a little bit mechanical on the retrieve, which isn’t much of a burden for a high-quality reel that’ll run you less than thirty dollars. One of the niftier things about this reel is that it has a hook holder, so you can put your hook into it to avoid possible injuries. It’s not completely necessary since most anglers know to hook their line on their rod’s line guides while in transit, but it does make a nice little feature that’s not commonly seen. This reel probably offers the absolute best value for the money of those we’ve reviewed here, and it makes a perfect first reel for a child or novice due to its easy use and low, low price. If you’re not sure which one of these spin cast reels will best suit your needs, we’d like to boldly recommend the Zebco Omega ZO3PRO. 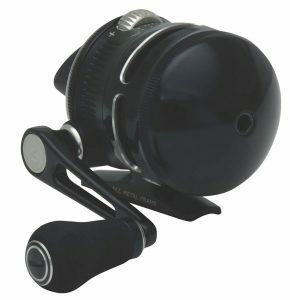 It’s simply one of the best available on the market and the size is suited for almost anything a spin cast reel can do. It’s durable and smooth as well, and sure to make your day trip a pleasure. That said, spincast reels make for an excellent introduction to the novice angler. They’re simple to use and can perform impressively with smaller species like crappie and bluegill. These smaller fish are often among the first that will be targeted by someone new to the sport. 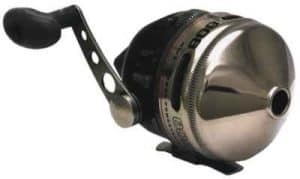 Some fishermen prefer to aim for these smaller fish even after they’ve attained a level of proficiency in the sport, and this style of reel remains a great choice for them. There’s quite a few of them available on the market, but even if you’re completely new to the sport try not to purchase an excessively cheap, generic model as these tend to be rather flimsy. Below we’ll show you five of the best of this style on the market, and you can’t go wrong with any of them. While they’re not the correct choice for the professional or tournament angler, spin casting reels are quite a bit more useful than it seems at first glance. There’s no reason to scoff at them, they make a great back-up and are the perfect choice for the amateur. Despite their bad name in the professional angling world, spin cast reels do have a variety of uses. If you’re a novice, looking for a reel for your child, or just want the addition to your bait pole you want to strongly consider adding one to your equipment. There’s no reason to hesitate, they’re cheap and a great investment in your angling adventures. I am Steven, an experienced fisherman, and outdoor enthusiast. My life-long passion for fishing began when my father taught me how to fish at the age of ten. I started luremefish.com to share my extensive knowledge of all things fishing. What’s the Best Spinnerbait for Night Fishing? What Spinning Reel Size Should I Use for Bass Fishing? Are telescopic fishing rods any good? luremefish.com is a participant in the Amazon Services LLC Associates Program, an affiliate advertising program designed to provide a means for sites to earn advertising fees by advertising and linking to amazon.com.